Background: The recently developed real-time 3-dimensional echocardiography (RT3DE) is a promising imaging method to quantify cardiac chamber volumes and their functions in clinical practice. However, normal reference values of RT3DE parameters have not been fully investigated in a large, healthy Japanese population. Methods and Results: This study consisted of 410 healthy subjects aged from 20 to 69 years who had a RT3DE at one of the 23 collaborating institutions. All subjects had no history of cardiac disease and no risk factors. The mean values in men and women were as follows: 50 ± 12ml/m2 and 46 ± 9ml/m2 for left ventricular (LV) end-diastolic volume index, 19 ± 5ml/m2 and 17 ± 4ml/m2 for end-systolic volume index, 61 ± 4% and 63 ± 4% for ejection fraction, 64 ± 12g/m2 and 56 ± 11g/m2 for mass index, 23 ± 6ml/m2 and 24 ± 6ml/m2 for left atrial (LA) maximum volume index, 10 ± 3ml/m2 and 10 ± 3ml/m2 for minimum volume index, and 58 ± 6% and 58 ± 6% for percent volume change. LV sizes decreased with age, whereas LV mass index did not change. LA sizes slightly increased with age. 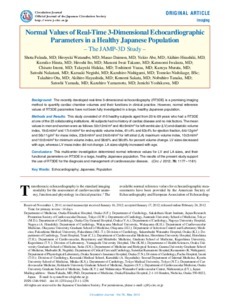 Conclusions: This multicenter investigation determined normal reference values for LV and LA sizes, and their functional parameters on RT3DE in a large, healthy Japanese population. The results of the present study support the use of RT3DE for the diagnosis and management of cardiovascular disease.